BLUEPRINT will focus on cell types and diseases of the Haematopoietic System as these are medically highly relevant, readily accessible and well characterized. Haematopoiesis is the process of proliferation and differentiation of the haematopoietic stem cell (HSC) that leads to the formation of the different populations of mature cellular elements in the peripheral blood. The transcriptional regulation of self-renewal and lineage commitment of the HSC is the most in-depth researched stem cell system. The epigenetic roadmap of haematopoietic differentiation from the pluripotent HSC through various multipotent precursor cells to mature stages is however still missing. BLUEPRINT will fill this gap by defining the reference epigenomes of >50 primary cells from healthy individuals as well as >50 neoplastic counterparts of the healthy cells and 8 primary cells from patients suffering from the chronic autoimmune diseases, type 1 diabetes. Biological samples: Although immortalized cell lines have proved useful for proof-of-concept studies in epigenomics, BLUEPRINT will focus on primary cells that reflect the in vivo epigenome to maximize relevance of the data for human health and disease. The Healthy Reference Set will be of about 50 different types of normal blood cells obtained from healthy individuals. The epigenomes of the Healthy Reference Set will be compared with those generated: (i) with 50 blood cells, all being counterparts of the healthy blood cells, obtained from cancer patients representing the entire spectrum of haematopoietic neoplasias and will be recruited via the German and Spanish ICGC projects, respectively, and from the GRAAL and HOVON studies, (ii) with eight immune-type blood cells from type I diabetes cases of the UK Twin collection and to determine the effect of common sequence variation on the epigenome the epigenome of 200 cells (2 types of immune blood cells from 100 Cambridge BioResource volunteers) will be studied. BLUEPRINT considers the generation and dissemination of reference epigenomes from blood cell lineages of healthy and diseased individuals as its top priority. The resulting BLUEPRINT-IHEC Resource will be unprecedented with respect to integrated genomic, epigenomic, biological and clinical information for the advancement of basic and biomedical research. The obtained information will be used to characterize leukaemia and autoimmune disease states that originate from defined cell lineages and aim to translate it into prognostic and diagnostic biomarkers. For selected states, this will be complemented in mouse models that are relevant for these diseases and for the validation of drug targets and their inhibition by small compounds. Mammalian blood formation or haematopoiesis remains the best-studied system of stem cell biology. Because mature blood cells have restricted longevity under homeostasis or transit to other tissues for further differentiation (e.g. memory immune cells, monocyte-derived tissue macrophages, etc.) cells in the peripheral blood must be regularly replenished. In addition physiologic stress may require the more rapid generation of specific cells, e.g. neutrophils to provide instantaneous innate immunity. Under both these conditions, a single cell type, the haematopoietic stem cell (HSC) generates all blood cells throughout the lifetime of an organism. HSCs are rare and relatively quiescent cells that reside in the bone marrow and which are on cell division fated to either self-renew (to form an identical daughter cell), differentiate (to form a progenitor cell or progenitor), undergo apoptosis or migrate. On further cell divisions, progenitors continue to lose self-renewal capacity and progressively become restricted to form a particular type of mature blood cell. 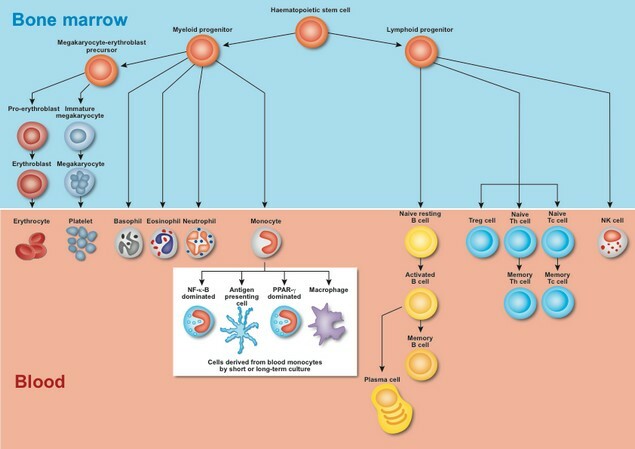 Blood formation may therefore be viewed as a hierarchical process and classically differentiation is defined to occur along the myeloid and lymphoid lineages as depicted in Figure 1. The precise identity of the cellular intermediates and the geometry of the branch points is still the subject of intense investigation. The blood system therefore provides a paradigm in which to delineate the fundamental principles of cell fate determination and of the regulation of proliferation and lifespan, which differ significantly between the different types of blood cells. Measurement technologies and quality assurance: In order to ensure timely delivery of these goals, BLUEPRINT will harness existing proven technologies and available samples to facilitate a smooth and efficient start of the project. In the initial phase, BLUEPRINT will characterize each sample by generating a common set of high-resolution and quantitative measurements, using deep-sequencing technology. Two definition of reference epigenome will be used: the IHEC-core set consisting of transcriptome-seq, bisulfite sequencing (BS-seq), DNAseI-seq and six histone marks as well as a BLUEPRINT-additional set, depending on the availability of material, comprising >6 histone marks plus 2 other factors. ChIP-seq, RNA and microRNA profiles using RNA-seq and chromatin accessibility using DNaseI-seq will be employed. In parallel, emerging more cost efficient sequencing alternatives will be evaluated as part of RA3 and, if found to be mature and superior, will replace existing technologies. To ensure highest quality and standards, protocols based on rigorously tested SOPs for each application will be implemented at the three designated sequencing centres. One topic has been dedicated to assay standardization to ensure common protocols and quality standards and to supply only validated and standardized reagents such as antibodies for ChIP and define the quality control procedures.